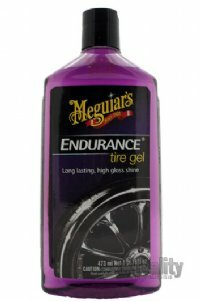 Meguiar's G75 Endurance Tire Gel - 16 oz. Protection that lasts weeks, even through repeat washing and rain. Legendary polymer formula protects tires and keeps them black. Meguiar's Endurance Tire Gel contains premium ingredients that produce a rich, dark shine that lasts weeks, not days, even through rain! Its legendary polymer formulation protects tires and keeps them from turning brown over time. Eliminate the mess of overspray, drips, streaks and spotted driveways with Meguiar's Endurance Tire Gel.